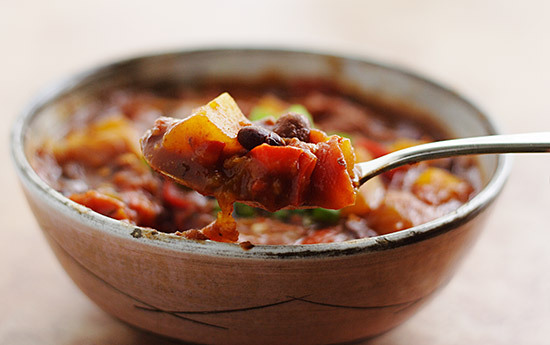 This thick, richly-flavored vegan chili includes butternut squash and beans. Hearty, filling, and gluten-free. I apologize for my absence from blogging for the last week, but it’s hard to write about cooking when you haven’t been doing any. Until last night, I hadn’t really cooked anything since my omelette last Thursday morning. 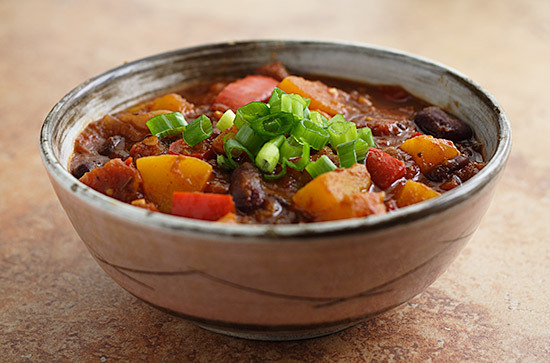 But I was determined to make the time to cook us a healthy meal, and I’d been planning this chili for about two weeks. It’s actually a very easy recipe, once you prepare the butternut squash. I used to avoid recipes with chopped, uncooked winter squash because it seemed like so much work to peel and chop it. But I’ve found it’s very easy to handle if you first cut the squash into sections and then use a serrated peeler to remove the skin. First, slice off the stem at the top. Then, cut the squash in half crosswise, just at the base of the “neck.” Then stand each half upright and slice it in half vertically. Use a grapefruit spoon to scrape out the seeds in the cavity sections, and then cut them in half again. Peel each section, using the peeler or a good paring knife. Then chop into cubes. 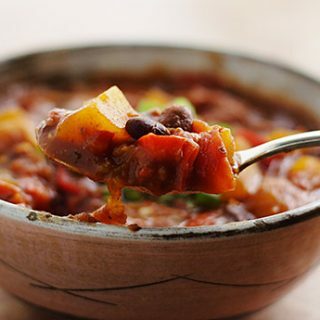 I used a canned, organic blend of pinto, kidney, and black beans, but you can use any kind of beans you like in this mild but richly flavored chili. If you’re using home-cooked beans, use about 3 cups. 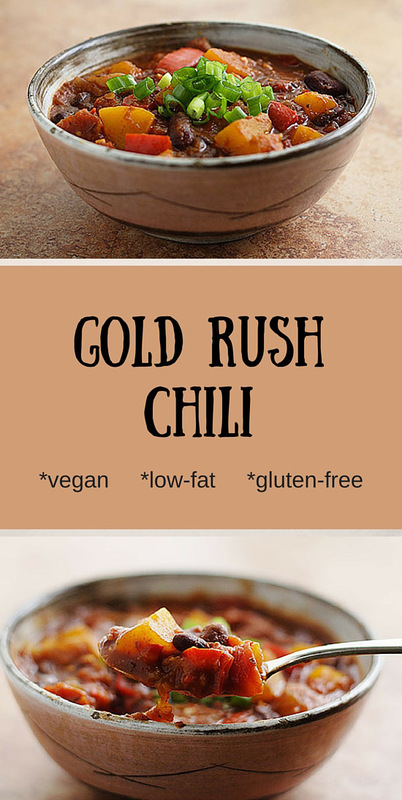 This makes a very thick chili. Cook over low heat and try not to add any extra water unless absolutely necessary. Prepare the butternut squash (see discussion above), and set it aside. Heat a large, non-stick pot over medium-high heat, and add the onion and bell pepper. Sauté until the onion is translucent and the pepper is soft, about 7-9 minutes. (You may add a little water to prevent sticking.) Add the garlic and sauté for 2 more minutes. Add all the seasonings, and stir well to coat the vegetables. Stir in the tomatoes (and their juice), water, squash, salt, and pepper. Cover and reduce the heat to a simmer. Cook for 20 minutes. Add the beans, and adjust the seasonings, if necessary. Cover and cook until the squash is tender but not falling apart (about 40 minutes). Serve in bowls, garnished with green onions. Serving suggestion: I like to serve this with plenty of steamed vegetables (broccoli and cauliflower) or a large green salad and some baked tortilla chips or crackers for added crunch. Nutritional info below assumes canned beans that contain sodium. You can reduce the sodium by using unsalted beans and tomatoes. This is one of our favorite recipes, in that we can feed it to anyone and it's universally liked, even praised. No one, not even our most avowedly carnivorous friends, thinks to ask whether it has meat and no has a clue about its fat content. When people ask for the recipe – and they do – they are always surprised by one element or the other (no oil, no meat). I would love to make this and purchased a packed of already cut and peeled squash from Costco. Do you know about how many cups one butternut squash would yield? C, the recipe is pretty flexible. I would aim for about 2 cups of squash cubes, but I think it could absorb even more. Just use what you have. Hope you enjoy it! I made this for my family's potluck Christmas dinner tonight as an option for myself and two other vegetarians in the family – and it was a hit even among non-vegetarians! I added more garlic, spices, and a bit of red pepper flakes to give it a kick, and I got several compliments from the meat-eaters (which, as you probably know, is usually a big deal – ha). Thank you and Happy Holidays! Yummy! I used fire roasted crushed tomatoes and baked butternut squash that was sleeping in my freezer. The squash did break down but didn't hurt the finished chilli. Maybe the baked squash gave the dish extra flavor? I think I will add extra beans some time and serve this as a dip with tortilla chips. Kelly, this is just a guess because I don't measure the servings (I base the number of servings on how many helpings my family actually gets out of a recipe). But based on the ingredients and from measuring the size of my bowl, I'd say a serving is between 1 1/2 and 1 3/4 cups. Hope that helps! I simply adore this recipe, and it is one I keep going back to. I (like other commenters) have served this to meat eaters and non meat eaters, and have yet to find someone who doesn’t like this. Just made this again for the 2nd or 3rd time– one of my all-time favorite ways to eat Butternut squash or pumpkin!! Thanks for another WINNER, Susan!! I made this recipe over the weekend and it was a delight. The squash really didn’t add that much to the flavor, I didn’t feel, but it added a richness and an extra chew factor, making it more “meaty”. Very nice dish, will make again. This sounds yummy. How long would you cook if you were using a pressure cooker? I’m often on a tight time budget in the evening to get dinner ready after picking up the little guy at some activity or another. If I were going to do it in a pressure cooker, I would do step 2 for about 7 minutes at high pressure and then add the beans (step 3) and cook for another 5 minutes under pressure. Then I’d check to make sure the squash was tender and the flavors combined. If it needs more time, I would cook it without pressure so that the beans don’t turn to mush. Im so glad i found your site…. I’m new at the Vegan cooking and your recipes has me excited! What would you suggest i substitute the pepper and chillies with? The people I’m cooking for doesn’t eat hot or spicy…. perhaps more garlic and herbs? Im making this for lunch tomorrow, i will let you know how it went. Susan — another one of your recipes that’s found its way into our regular rotation. We garnish with chopped green onion and toasted pumpkin seeds. Love it! This was satisfying like chicken soup (which I no longer eat) and split pea soup on a winter day. 2 variations I made: 2 tsp cinnamon & I used dal (Indian lentil) for the bean. Add them when the liquid goes in & you can use dried dal. Also, I don’t use salt – never miss it. This recipe does not suffer without it. My wife (no vegan!) asked for extra helpings. …got a good winter hug from this soup, as well. Thanks! Sounds yummy but: Cutting up a winter squash is so difficult, the squash is so hard! Any suggestions? You can make it softer by microwaving or baking the whole squash slightly. It doesn’t have to be cooked all the way through, just enough to soften it. Sounds delicious! But not entirely sure if I’ll find Mexican oregano here in Scotland… Will substituting regular oregano work by chance? The flavor is slightly different but should be fine. Hope you enjoy it! I’m really excited to try this recipe now that it’s officially fall and cooling down quite a bit up in Michigan. Thank you for posting it, I’m sure it will be fantastic! I am so excited to try this recipe! But I have very little time in the evenings so I’m interested in making this in the crockpot… do you have any suggestions on how to do so? I’m thinking of cooking it on medium for about 4-6 hours…or would that be too long? I think it would be better to cook it on low. 4-6 hours would probably be about right. I made this for supper last night to use up some butternut squash leftover from last week’s CSA share. Then I had a second supper of it later on. Then I woke this morning craving this chili. It is THAT good. Hi! This recipe looks sooo good. Do you think this recipe would freeze well? I do mostly once a month cooking and am looking for new recipes to add. thanks!! Yes, it should freeze just fine. Hope you enjoy it. I made a few additions to suit our tastes: cut the garlic in half, added 4 little hot yellow peppers, 1 Tbsp cocoa powder, and about 1/4 cup of ketchup. It sounds weird, but the cocoa adds a smokey, bitter node and the ketchup adds thickening and a subtle vinegar bite and sweetness. And I didn’t have a butternut squash, so I used a small yellow crookneck squash. Amazing versatile recipe. Thanks! Thanks! @ What size squash? Lbs? I used a average-sized butternut squash. I didn’t weight it, but a little more or less won’t hurt the recipe. This looks delicious! a hearty dish for a cool fall day. I’m curious, how large is a serving size? And why is the sodium content per serving so high? Is it the canned beans and canned tomatoes? Might it be better to use no salt versions? I haven’t measured each serving, but if I had to guess, I would say a serving is between 1 3/4 to 2 cups. The sodium is almost totally due to the canned foods. No-salt versions would reduce it a lot.